Hello Fellow Collectors and Visitors. The other day I posted the different "Blue" boxes for the Mickey Mouse wristwatches. I mentioned I was going to post a follow up with an "Oddity". First I have to say, I've only seen one other example of this styling on a Blog ... http://75yearsfortheinegersollmickey.blogspot.com/... 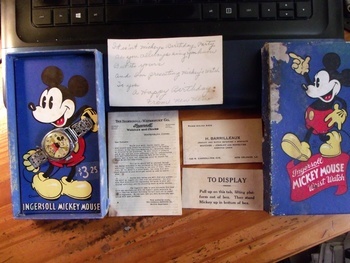 I've had this full set for sometime and always wondered about it, but all the extra paperwork and condition are correct. There was an attached note, gifting this to someone back when and a card from the Jewelry Store, I guessing where it was purchased. I have to conclude this to be an Authentic piece, but have never ran across any advertisements for reference. I have cross referenced the serial # on movement and it dates 1938. 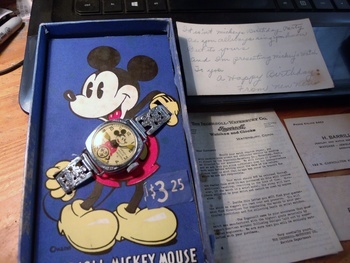 Through the years, I consider myself somewhat knowledgeable on Mickey watches, but ready for any and all comments/help to put this "Mystery" to rest. Thank You Michael, always very appreciated!! Thank You Longings for "ALL" the loves and support, very appreciated!! Good Day Phil, Thank you very much for the loves and support, deeply appreciated!! they deserve extra scrutiny to my mind. @ Vonsboy, I agree with your assessment with "Out" of the normal and need of collaboration. I've been searching for several years. But in defense, possible hypothesis for this design, Ingersoll and Disney were looking for a "New" design in 1937 and came up with the smaller Deluxe models and continued the Standard variant also. This could possibly be a "Test Market" styling before production. 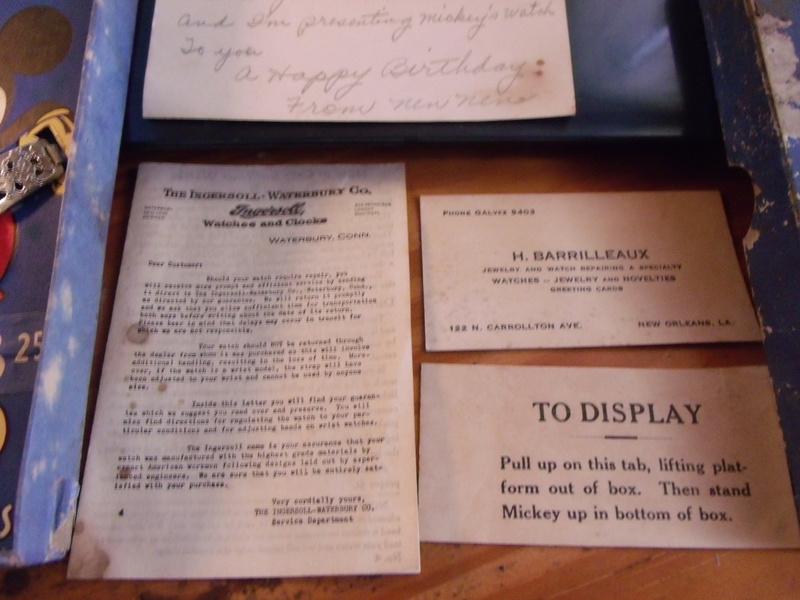 It has happen before with the 1934 Donald Duck and I've never seen an advertisement for the Donald. I'm not saying this is the case, just a plausible explanation. I can remember when the first Donald showed up back then...Was a big deal. for dropping in and sharing the loves. Howdy Gang!!!! Thank you Scott, bijoucaillouvintage, Kurt & ttomtucker for "ALL" the loves and support, always very appreciated!! In my best Robin Williams voice.....Gooooooood Morrrrning CW!!!!! for stopping by and sharing the loves and support, very appreciated!! for the wonderful complement and the support, very appreciated!! Thanks Pascale for your support, always very appreciated!!! Thank You beyemvey for all the loves and support, deeply appreciated!! for dropping by and sharing the loves, very appreciated!! for dropping in and sharing the loves, very appreciated!! Thank you Chevelleman69 for all the loves and support, very appreciated!! 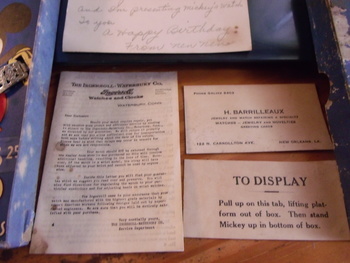 Hi Kerry,I visited with the seller of that box,business card, and paperwork just before he shipped it to make a copy of the warranty paper. I loved the 122 N. Carrollton Ave. address and mostly the "GALVEZ 6409"! That really dates the timeline in New Orleans! 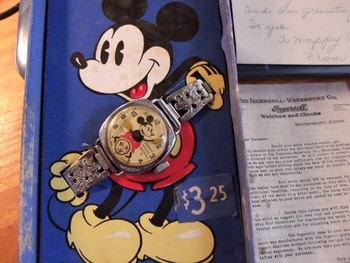 I'm wanting to contact you with some items and needs of items?Is it possible to speak with you about World Fair 1933 wire lug watch?